On my last post I mentioned weight training, but I realized I didn't quite clarify what I do. Well, that's not very helpful...and this post won't be either. :P But I will explain very soon. In the meantime, Whittle My Middle is still going on. I haven't given up yet! WIN! 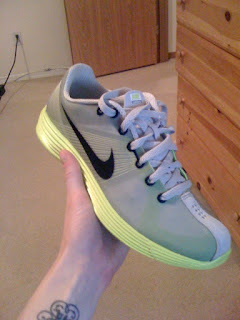 Nike Lunaracers!! Oh goodness! They're wicked awesome and light as a slipper! But, unfortunately they're a size 6.5 and I'm a 7 in running shoes. Bummer! I have to wait again for an exchange. I really wanted to just try them out even with scrunched toes...but I thought it wouldn't be the best idea. Stupid brain telling my feet what not to do. GAH! They're grey with neon yellow soles. Sweeeet. By the way, thank you for all of the kind words of encouragement on my Strength & Muscles post. Honestly, I was not trying to phish for comments or flattery at all. I'm not much of a "show my stomach" kind of gal anymore (that was so 2001, ha ha!). This is strictly for core strength and so far I can feel it working! Apparently a certain co-worker of mine checks out my blog and I didn't know it & gave me some friendly crap for my measurements. :) What's up C?? How about some 25 cent coffee tomorrow AM? Hee hee. Love the shoes! The style is a bit of a throwback to early Nikes. So cool! Oh cool shoes Zoe!! I showed Dave your post yesterday so he could see Trav and them workout.. He saw your measurements and said that some Body Builders have thighs as big as your waist. LOL!!! Hugs and have a great day.. This week is dragging on.. Awesome shoes! I hope the exchange happens quickly! Agree with you that taking those shoes out for a run being too small wouldn't have been a great idea!! 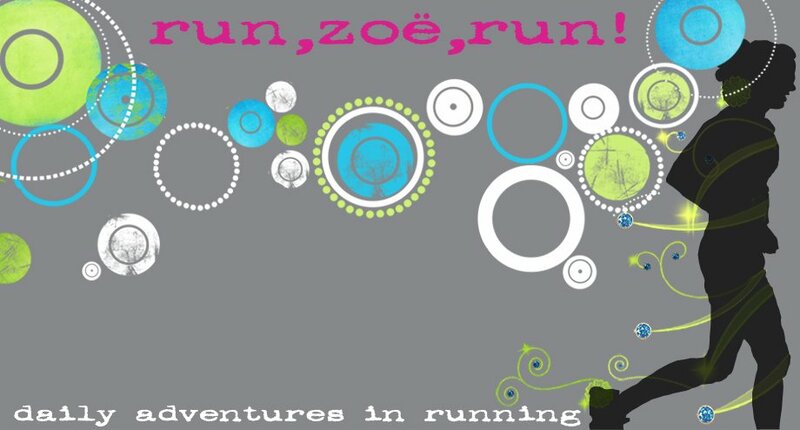 new shoes - always exciting :) keep it up with the WMMC! Aaaww. I always want to buy those super light weight running shoes. But I got the the dang over-pronatin'.